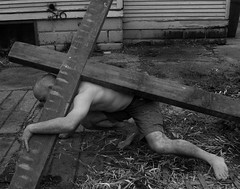 This is a phot of myself in the role of Jesus stumbling with his cross. It is a reference image for an illustration I am working on for Christainity Today. I built the cross out of some old timbers I salvaged last fall. Pearl took the photo. Today I cut a wood block and printed it with several different pieces of ephemera which I hope to combine into a collage tommorrow when the ink is dry. The thought of Jesus stumbling under his load and needed help to continue is a compelling one, especiallys since we live within a culture that makes you feel such shame when you reach out for help. Some times you just can't get there on your own.